Anglin’s is proud of our history. We started in 1930 by the O.L. 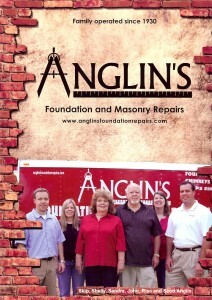 Anglin and Sons as a foundation and masonry repair company. His ambition was to offer a superior masonry service for all types of masonry needs. All the foundational work had to be done by hand in the 1930s. In the United States, they just experienced the Wall Street Crash of 1929 and the Great Depression began. In 1930, the average house cost around $7,000 and a gallon of gas was 10 cents. A new car would cost you about $650 and a pair of eye vision glasses cost about $4. Betty Boop and Donald Duck made their debut and the Empire State Building was completed. The styles of the 1930’s were presented in the issues of Good Housekeeping magazine. Anglin’s has been around for many decades to see the rise and fall of the economy and cycle of styles and fads that seem to come and go. We’ve weathered the storms through wars and peace in our country. We’ve constantly remained committed to our roots and history, and at the same time we’ve constantly been keeping up with the new technology in the foundation repair industry. At Anglin’s, we remain committed to our mission to provide a permanent engineered/designed foundation solution through the development of innovative products and systems, installation and services at the very best price! We stood the test of time and are thankful for our rich history that makes us who we are. Contact us today for a lifetime of structural and masonry repair experience.